Fifty Years Down The Drain? This morning I read a supposed true story about the ACA clause that enables the White House to set up gas stations to dispense free gas to those too poor to get to a doctor because they had no gas. This afternoon, I fact checked the article and it is false. It didn’t keep me from drawing a cartoon to depict my opinion about the matter. All day I kept asking myself, why would our beloved president want to give free gas to poor people? If they are poor would they even own a car? Would they take an empty milk jug to get gas and then come home to look for someone who would take them to a doctor for a free gallon? None of it made sense. Because of how I feel about Obama and his administration, I bought the lie hook, line, and sinker. He has done stupid things before, why not this? It falls into the free phone category, i.e. poor people need a phone to call 911. I believe he would deliberately destroy fifty years of Civil Rights progress just to start another redistribution scheme. Anyway, SNOPES declares this story false, but I am not buying that it isn’t inside the thousands of pages of the Un-Affordable Care Act we so dearly refer to as Obama Care. The joke is on me. 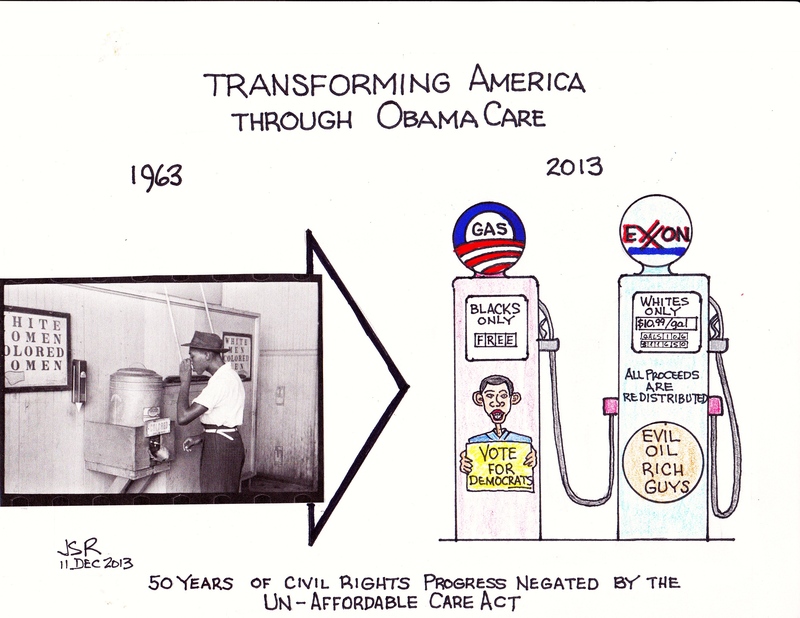 Filed under: Cartoons, Conservative, family, Government, health care | Tagged: ACA, BarackObama, Civil Rights, Obama, Patient Protection and Affordable Care Act, President, United States, White House |	Comments Off on Fifty Years Down The Drain?